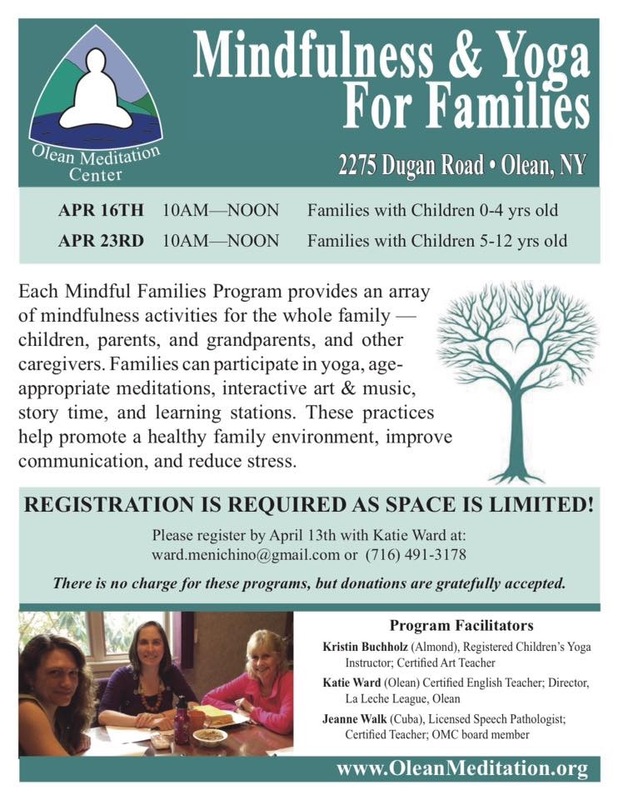 In April 2016, the Olean Meditation Center hosted its first set of Mindful Families events. We featured family yoga, arts & crafts, music, and meditation for different ages. Our purpose was to provide community and fun with enriching, mindful activities from which family members of all ages could benefit. We now host quarterly gatherings specially designed for families and/or children. Mindful Families events are non-sectarian and open to any family wishing to attend. If you are interested in helping plan sessions, please let us know. Also, if you know other families who might enjoy participating with us, please invite them. Please contact us with ideas & questions, and we hope you will join us for future Mindful Families sessions! Check the OMC calendar for Mindful Families events!